Stories of disasters at sea, whether about Roman triremes, the treasure fleet of the Spanish Main, or great transatlantic ocean liners, fire the imagination as little else can. From the historical sinkings of the Titanic and the Lusitania to the recent capsizing of a Mediterranean cruise ship, the study of shipwrecks also makes for a new and very different understanding of world history. A History of the World in Sixteen Shipwrecks explores the age-old, immensely hazardous, persistently romantic, and ongoing process of moving people and goods across the seven seas. In recounting the stories of ships and the people who made and sailed them, from the earliest craft plying the ancient Nile to the Exxon Valdez, Stewart Gordon argues that the gradual integration of mainly local and separate maritime domains into fewer, larger, and more interdependent regions offers a unique perspective on world history. Gordon draws a number of provocative conclusions from his study, among them that the European "Age of Exploration" as a singular event is simply a myth: over the millennia, many cultures, east and west, have explored far-flung maritime worlds, and technologies of shipbuilding and navigation have been among the main drivers of science and exploration throughout history. In a series of compelling narratives, A History of the World in Sixteen Shipwrecks shows that the development of institutions and technologies that made the terrifying oceans familiar and turned unknown seas into well-traveled sea-lanes matters profoundly in our modern world. A History of the World in Sixteen Shipwrecks is a great source for readers who seek a broad overview of maritime history." -- "The Great Circle, Journal of the Australian Association for Maritime History"
Gordon explains the background of each type of ship, how it was discovered (in the case of the older vessels), how it came to be in its current state, and why it matters. The author emphasizes the importance of each ship: did its discovery contribute to knowledge of a past civilization? What does it reveal about the politics, economics, and culture of the people who created it? Did its loss result in a significant change in maritime regulations, safety, and shipbuilding practices? These are the questions that defined Gordon's choices, which demonstrate how maritime history is a significant part of world history. . . . Recommended." -- "Choice"
"This book provides a unique opportunity for the study of world history with focus on global shipping and maritime transit from earliest times to present. 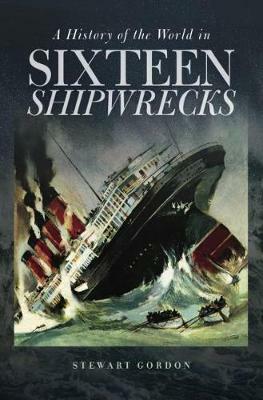 Gordon uses details of shipwreck recoveries and their salvaged cargoes as the basis for his concise discussions of wider period issues, such as technology, environment, and societal change, as his tracks from shipwreck sources offer opportunity for follow up discussion and pair well with world history texts. The book as a whole is an engaging series of single chapter reads, as each chapter differs in its documentation, discussion, and varying approach to global history." -- "World History Connected"
Innovative approach. . . . Interesting insights.-- "Naval History"